There are only eighty-eight of them, but when they are infused with the creativity of the human spirit, the possibilities are endless. Live your life fully, every day. Be in the moment. Smile, laugh, dance and dream. Slow down and take a breath. Pay attention. Soak it all in. Cherish where you are, who you love, and everything good about this moment. Don’t wait. Cherish it all now, feel it all now, love it all now. And as you go, remember to be kind to yourself and to each other. Because kindness, gratitude and love are the fuels that make the Karmic engine thrive. It was suggested to me that a proper introduction was in order for my recent book Animal Spirits: A Collection of Nature Photographs. So, please enjoy the short film above! (run time: approx. 2 minutes; video has sound) All of the images in the video are featured in the book, plus many more… in fact, it contains almost two hundred color and black-and-white nature photographs of animals from around the world. If just for the Emerson texts alone, however, it is easily worth the price of admission: the book features a generous selection of mind-expanding quotes carefully curated from the writings of noted transcendentalist Ralph Waldo Emerson. To find the book on Amazon, please click the Animal Spirits image in the right hand margin. 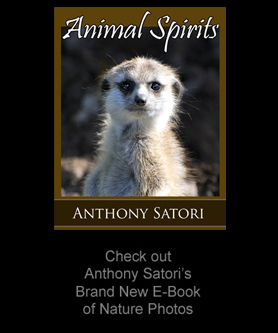 Or use the link here: Animal Spirits by Anthony Satori.